The patented Primo Oval Large features up to 305 square inches of standard cooking surface, expandable up to 495" with our Extended Cooking Rack! Other features include a cast iron chimney cap, easy to read thermometer, reversible cooking grates and stainless steel lower vent door. The Primo displayed here shows the optional Primo Cart with Basket & One Piece Island Top with Two Cup Holders for Oval 300. 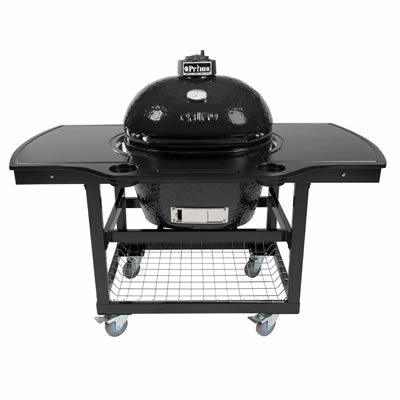 The Primo Oval LG requires 10 inches of clearance behind the grill to open properly. The depth of the Oval LG is 18.5 inches.